Just found this old trailer for the NBC television series "Get Smart" back in 1965. It made me smile while thinking about the distance between paranoid communication of the older days and the new definition of conversation. 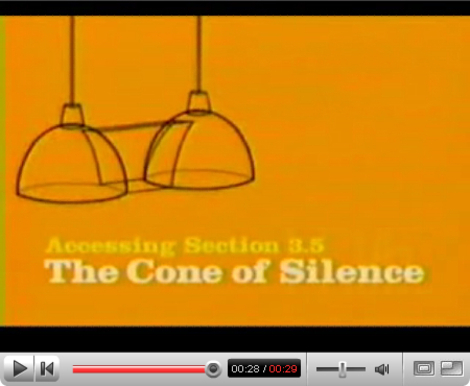 So remember : Don't use the "Cone of Silence"
Luc, what a wonderful way to illustrate the power of conversation -- and have a giggle in the process! Get Smart brings back good memories... Thanks for connecting back to Flooring The Consumer, too! However, despite the efforts to avoid the cone of silence, there are numerous people who refuse to conversate without. Horrible experience. You're welcome... thanks for pointing the new definitions of "Conversation". You're right. Too many still use this evil device! I loved that show! So many laughs. Thanks for the smile from this — "Max Smart" was a genius comedian. Such interesting points that everyone is making about conversation!